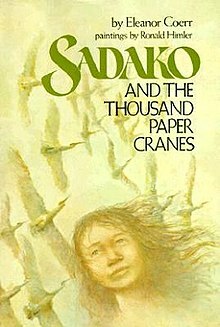 Sadako and the Thousand Paper Cranes is a children's historical novel written by Canadian-American author Eleanor Coerr and published in 1977. It is set in Japan after World War II. The book has been translated into many languages and published in many places, to be used for peace education programs in primary schools. The short novel is a fictional retelling of the story of Sadako Sasaki, who lived in Hiroshima at the time of the atomic bombing by the United States. Sadako was 2 years old when the atomic bomb (Little Boy) was dropped on August 6, 1945, near her home by Misasa Bridge in Hiroshima, Japan. She was at home when the explosion occurred, about one mile from ground zero. In November 1954, when she was 12 she developed swellings on her neck and behind her ears. In January 1955, purple spots had formed on her legs. Subsequently, she was diagnosed with leukemia (her mother referred to it as "an atom bomb disease"). She was hospitalized on February 21, 1955, and given a year to live. After being diagnosed with leukemia from the radiation, Sadako's friend told her to fold origami paper cranes (orizuru) in hope of making a thousand of them. She was inspired to do so by the Japanese legend that one who created a thousand origami cranes would be granted a wish. Her wish was simply to live. In this retelling of her story, she managed to fold only 644 cranes before she became too weak to fold any more, and died on the morning of October 25, 1955. Her friends and family helped finish her dream by folding the rest of the cranes, which were buried with Sadako. However, the claim in the book that Sadako "died before completing the 1000 cranes, and her two friends completed the task, placing the finished cranes in her casket" is not backed up by her surviving family members. According to her family, and especially her older brother Masahiro Sasaki who speaks on his sister's life at events, Sadako not only exceeded 644 cranes, she exceeded her goal of 1000 and died having folded approximately 1400 paper cranes. Masahiro Sadako, says in his book The Complete Story of Sadako Sasaki that she exceeded her goal. Mr. Sasaki and the family have donated some of Sadako's cranes at places of importance around the world: in NYC at the 9-11 memorial, at Pearl Harbor, Hawaii, at The Truman Library & Museum on November 19, 2015, at Museum Of Tolerance on May 26, 2016, and the Japanese-American National Museum three days later. USS Arizona Crane Donation and President Truman Museum Donation helped by Mr. Clifton Truman Daniel who is the grandson of President Truman. After her death, Sadako's friends and schoolmates published a collection of letters in order to raise funds to build a memorial to her and all of the children who had died from the effects of the atomic bomb. In 1958, a statue of Sadako holding a golden crane was unveiled in the Hiroshima Peace Memorial, also called the Genbaku Dome, and installed in the Hiroshima Peace Park. At the foot of the statue is a plaque that reads: "This is our cry. This is our prayer. Peace on Earth." Every year on Obon Day, which is a holiday in Japan to remember the departed spirits of one's ancestors, thousands of people leave paper cranes near the statue. A paper crane database has been established online for contributors to leave a message of peace and to keep a record of those who have donated cranes. In addition to Eleanor Coerr's story first published in 1977, Sadako's story has become familiar to many school children around the world through the novels The Day of the Bomb (1961, in German, Sadako will leben) by the Austrian writer Karl Bruckner. Sadako is also briefly mentioned in Children of the Ashes, Robert Jungk's historical account of the lives of Hiroshima victims and survivors and about Japan World War II. Masahiro Sasaki, Sadako's older brother, co-wrote "The Complete Story of Sadako Sasaki" with The Peace Crane Project founder Sue DiCicco in 2018, bringing what he feels is Sadako's complete story to the English speaking world for the first time. The book contains many family photos and new illustrations never before seen by the public. Masahiro also wrote 'Sadako's One Thousand Paper Cranes', published in Japanese in 2013. Evolving Pictures Entertainment is producing a motion picture tentatively entitled Sadako and the Magic of Paper Cranes, focuses on a true story written by three-time Academy Award winning producer, director, documentarian Malcolm Clarke about chronicling a group of fifth grade students from Albuquerque, New Mexico when inspired by their teacher, make their dream of building a monument come true, to honor the legend and spirit of the young girl Sadako Sasaki. There is also a statue of Sadako in the Seattle Peace Park. In addition, Sadako's story was dramatized at the opening ceremony of the Goodwill Games 1990 in Seattle when, to Ellie Rabb's narration of Sadako's story, some 400 local schoolchildren handed out some 20,000 origami paper cranes to the opening day crowd, thereby honoring the memory of Sadako and spreading her unfulfilled dream for world peace. The Seattle souvenir cranes were supposedly crafted from an original 1,000 pieces sent over by children from Japan. Sadako has become a leading symbol of peace that is taught in Japanese schools on the anniversary of the Hiroshima bombing. In dedication to her, people all over the world celebrate August 6, as the annual Peace Day. In November 2015, Miyuki Sohara made "Orizuru 2015", an educational short film for children. This film is a friendship story and made with Los Angeles School kids, Hollywood actors and crews. Sadako's nephew appears in film and sings a song about Sadako's life, "Inori". This film was selected by Hiroshima International Film Festival in 2015 and afterward was released in Los Angeles on May 27, 2016, at its US premiere screening. This date coincided with President Obama's visit to Hiroshima with a gift for four paper cranes. At the same time, Miyuki Sohara coordinated Sadako's two crane donations to the Museum of Tolerance and the Japanese American National Museum. She also coordinated a lecture promoting peace with Sasaki and Clifton Truman Daniel, grandson of President Truman, to several schools in Southern California. Laurie Rubin and Jenny Taira, Co-founders and Artistic Directors of Ohana Arts, a children's theater and arts organization based in Honolulu, Hawai'i, have written a musical for youth performers called "Peace on Your Wings", based on the life of Sadako Sasaki and her message of hope and peace for the world. The musical has been performed across the United States and has the support and approval of members of Sadako's surviving family. The Bell Shakespeare theatre company in Sydney, Australia mounted a production of Sadako and the Thousand Paper Cranes during its 1997 season. The album Wanderer by the Death Metal/Metalcore band Heaven Shall Burn features a song called "Passage of the Crane" dedicated to her story, as does "Sadako's Wings of Hope" on Niobeth's album Silvery Moonbeams. ^ Coerr, Eleanor; illustrated by Ronald Himler (1977). Sadako and the Thousand Paper Cranes. Putnam Juvenile. ISBN 9780399205200. ^ "BRIDGEGATE FILMS – MOTION PICTURES – REALITY TV". BRIDGEGATE FILMS – MOTION PICTURES – REALITY TV. ^ "Special Exhibition 5". www.pcf.city.hiroshima.jp. ^ "Special Exhibition 4". www.pcf.city.hiroshima.jp. ^ "Ohana Arts – Official Site". Ohana Arts – Official Site.